As our previous Travelers have said: The Princess Wencheng Live Show is the biggest live show in Tibet that they have seen. It is the largest live show in Tibet and might be also one of the largest live show in Asia. 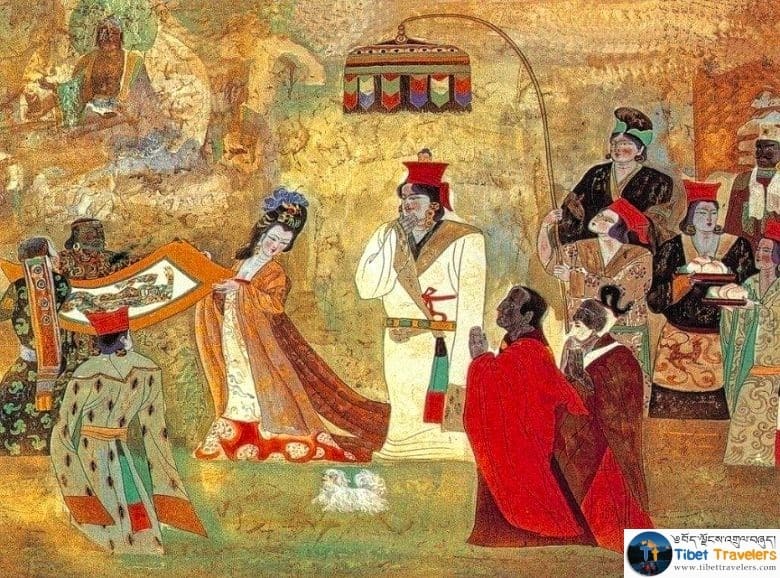 Princess Wencheng can be traced back to the 7th century during the time of 33rd King Srongtsen Gampo. One of the most popular kings with a great spiritual achievement. King Srongtsen Gampo is also known as the emanation of the compassion Buddha Chenrezig. During the 7th century, King Srongtsen Gampo has built the Potala Palace, Jokhang Temple, Ramoche Temple, Tradruk Dolma Temple, and many other small temples in Tibet. King Srongtsen Gampo has five consort. Three Tibetan princess, Nepali Princess Brikuti and Tang Dynasty Princess Wencheng. It took her around a year and a half to travel to Tibet during the 7th century. Princess Wencheng brought the statue of Buddha Shakyamuni into Tibet. The statue is known to be around 2600 years old. This is one of the statues which has got blessings from Buddha himself. The Statue of Buddha Shakyamuni brought to Tibet by the Princess Wencheng is located in the Jokhang Temple. The composition of King Srongtsen Gampo, Princess Brikuti from Nepal, and Princess Wencheng from Tang Dynasty has brought great changes in Tibet with deep improvements in the life of Tibetan people. Princess Wencheng and Princess Brikuti are known as the emanation of female Buddha Jetsun Dolma. Later Princess Wencheng spent most of her time in Yarlung valley in the Tsetang area. The Princess Wencheng Live Show is the largest live show in Tibet. The stage is around 100 meters with around 600 actors are participating in the live show. The live show is displayed in three languages, Tibetan, English, and Chinese. The live show will start around 8:30 - 9:00 pm until around 11:00 pm for 2 hours. There is no roof so sometimes when there is rain, the show will be canceled for the next day. The ticket for the show cost from 380Renminbi to 1080 Renminbi. There is some discount for the Travel agencies so let us know if Travelers are planning to join Wencheng Princess live show. Location of the live show is on the other side of Lhasa Kyichu river at Tsechokling village. Travelers can also enjoy a beautiful view of Lhasa and Potala Palace. The Princess Wencheng Show is the biggest live show in Tibet. Including the makeup and backstage workers, around 2000 people are getting the job from this live show. In the summer from May to October, Tibet Travelers arranges this show as our special Thank you gift for Travelers for booking a tour through Tibet Travelers. Beauties of nature are one of the main reasons to travel to Tibet. Mountains, lakes, rivers, and grassland are making Tibet a destination where Travelers dream is located. The other reasons for traveling to Tibet is the Buddhism. Tibet is the home of many great masters. Our ancestor's compassion is like an ocean and our ancestor's wisdom is like a sky. King Srongtsen Gampo is known to be able to see 1000 years ahead in advance so that's the reason he built Potala Palace with the help from the Nepali Princess Brikuti and Tang Princess Wencheng. Nowadays because of their greatness, many Tibetans like me can have a smooth life in Tibet. 87 queries in 0.275 seconds.